For those who reached the age when the Archie comics was popular and appreciated, Betty Cooper is a well-liked, rounded individual. She is your everyday, average-type girl (because in America blondes were the average), and was part of a rivalry with Veronica for the affection of her best friend and crush, Archie Andrews. She is the quintessential girl-next-door. She is not drop-dead gorgeous, but average-looking, was pretty, but what shone the most for her was her personality, her approachability, and the adaptability to live in a man’s world, and talk their talk. Betty Cooper was also—at least in my opinion—the best friend of Archie Andrews. Betty Cooper is the concept everyone searches for in their lives. Her antithesis, Veronica, represents the drop-dead bombshell or at least the seductive brunette that everyone will come across in their lives. Veronica is the unattainable crush the average person longs for, or dreams about. Betty Cooper, in contrast, is the person who you know, someone you can talk to confidently and easily, and someone you can confide in. She is the friend who is pretty in her own way, but someone you readily ignore because you’re too focused on the seductive Veronica. You’ve come across your Betty Cooper once, or even a lot of times in your life, but readily ignore her because someone is always prettier. Sometimes, you get attracted to a Veronica because she looks or acts like a Betty Cooper… she acts like your girl-next-door. I’ve searched a long time for my Betty Cooper, oftentimes realizing that it was a Veronica I was longing for. In High School, my great love—which I immortalized as “Everdearest”—acted and appeared like your average girl-next-door. Then again, no one really was drop-dead gorgeous then. 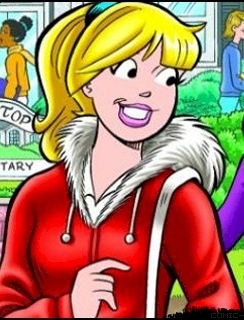 I’ve gotten attracted to girls which pique my interest because they begin as looking like Betty Cooper. But have I had a Betty in my life? Once or twice. While I was despairing for a Veronica that had a great effect on me, there was a Betty. But I didn’t notice, and couldn’t fall, because the Veronica was just too beautiful to ignore. The great Veronica of my life, at least where I am now, I first noticed circa 2011, at a time when well, I was moving on from another great crush. She was G, of who I wrote in my previous posts. While we crossed paths several times between 2011-2012, it was in 2013 (the unforgettable year) that she befriended me, or at least noticed me. This is where we frame the beginning of our story. You see, back in 2011, my present Bessie tried to introduce me—perhaps jokingly—to newcomers in our company. I readily dismissed them, first because I never liked arrangements out of my control, and also because G was in my mind. I hid that by letting people assume the most with my closeness with Bessie, which to this day I still consider my one success story. The two newcomers, I didn’t notice mostly because of the above reasons, but also because of their age. They were still in the middle of their education, and it felt there was not yet a level of maturity with them. One thing, though, I noticed with one: her bespectacled image reminded me of G. That is how I first noticed her—not any ideal love-strike or a sudden romantic epiphany, but as a reminder of someone I loved. As such, I was both attracted to her (hey, she looked like Go—I mean G), and compared her with G, the Veronica of that age. And in that year, 2012, I dismissed her. Of course, I couldn’t ignore an attraction. It just wasn’t strong enough to overpower a devotion to G. Nor was it strong enough to get noticed in 2014, when I was involved with “The Big Three”. But the attraction was present, and there was always the lingering question buried in my head. As I narrated in a previous post, 2014 concluded with a seeming end to the chapter of the “Big Three”, though I began to doubt the singleness of one of them. She was the current Veronica, the unattainable bombshell of that period. Because I clung on to hope and naivete, I ignored all the tell-tale signs and continued to assume the contradiction of her being single, despite evidence proving otherwise. Thus, this Veronica (which I identified with the monicker, Red Horse), was the target of my affections, a previously-mentioned song and dance number (Chinito Problems), and a despair which lingered on to the early part of 2015, when definitively I overheard someone point out—and decisively proving—that no, she was no longer available. In the chaos of 2012-2014, was there any space for a Betty Cooper? I will say how I noticed “Betty”: it was December 2014, and while she was conversing with a peer, she said something that made me look. The first time that I looked at her directly, and took notice. And she was beautiful. Pretty in a way I didn’t notice before. The next time I saw her, it reinforced my view. Why hadn’t I noticed her before? Why did I dismiss her for so long? The year turned. Two Veronicas—G and “Red Horse”­—were in my mind, G because I began to realize the extent of her loss (and feel overwhelming, overpowering grief), and Red Horse because I clung tenaciously to the hope that she was single, that I could make my feelings… uh, felt. Even weeks after I definitively proved to myself that she was taken, I was still hung up over her. At the time, well, Betty wasn’t Betty yet. Another definitive emotional hammer blow was still to happen. 2011 was a definitive year. It was an emotionally exhausting year, but it was a formative period that began many things. I noticed G, and came across her many times in the corridors. I was beginning to feel something for her. And the woman I would call Bessie would first arrive in the office. At that time I did have a close peer, which I talked to and confided to. When the new arrivals came, I didn’t much notice. But I can be proud to say that I made the first move towards having a “Bessie”. That year being an exhausting, painful year, I took refuge into people I could confide to, and be close to. At the time, I befriended a peer, but whenever Bessie would go home, I would join her. It wasn’t so much that I liked her… it was that at that time I desperately needed company, and I sought needed refuge. The closeness, my tendency to want to be close to her, my growing interest in her (though in honesty, she never really reached the point of affection), drew curiosity in my world. I liked being linked to her, as I liked being close to her. There was something in her that drew me closer to her, to want to get to know her. That was misinterpreted as infatuation, and as I hid my secret devotion to Godd—G at that time, I allowed them to treat it as such. Besides, I did want to be close to her. One year passed—the height of my being linked to her (2012). At the time I was savoring the stolen moments I could see G, though when my close friend asked if I liked her I denied it and said I don’t have affection for non-singles (and G was married at the time, but oh, the moments I could have with her were precious!). I began to like Bessie, and I’ve mentioned before that I wanted to be close to her, as a best friend. Acting out of character, I took the effort of approaching her often, being near her often, talking to her often. It took two years to finally be secure that she was, indeed, Bessie, but it was a rewarding moment. Here was someone I could throw ideas with, could confide in, be as nerdy as me, and generally have overlapping ideas and memories with me. And through the years, the closer I got to her, the more distant and guarded I became in my world. Everytime I reach out, I get burned. There was not one moment where I did not hear a sharp snap whenever I opened myself to anyone. With Bessie, I could be myself, and I could be the stupidest person, and she would understand, because she had been there before, or at least she gets why. She wasn’t judging, I guess I could say. We shared the same brain wavelengths… at least I thought we did. At the very least I could be very comfortable with her. I did not realize how alone I truly was when the news came in the recent months: she was leaving. It was for a reasonable cause (as they all are), and she would try to stay in touch. Of course, judging from my experience with G (who definitively shut me out), I doubted the consistency of long-distance communication. The impact was horrible—Bessie was leaving and I’d be isolated in an adverse world. She could not realize—and I would never tell her—how much she meant to me, how much she felt like family to me, how much she was like a sister to me. I was faced with the prospect of desolation, which added a new necessity for a Betty Cooper. Betty Cooper is a concept. She is the best friend and partner to Archie, who Archie can be comfortably himself with. In the midst of a collapsing world, I was desperately looking for my Betty Cooper. She was a beacon of stability and sanity in a life abandoned by G, devoid of meaningful contact, and impaired of companionship. I desperately looked for a partner who would be a new best friend, and a lover if possible. It was March 2015, and I was still depressed that I couldn’t at least express myself to my Veronica. So I turned to the pretty—no, beautiful—bespectacled girl who I first noticed in 2011 as looking like G, constantly comparing her to G, constantly wondering about her, and finally accepting in 2014. In a previous post I wrote that I shouldn’t pin my hopes and dreams on someone I liked, but in a crumbling world I had no choice. So she—my proto-Betty—would be my last great project with Bessie, because I had no idea how long I had before the walls close in on me. She could be my life partner, but more importantly, she could be my best friend I could confide in. I liked her a lot, and it was a blessing that she was single (out of all the women I’ve ever loved who weren’t), so I could finally have a sense of a stable relationship and companionship and be secure. Ideas, however, do not always equate to reality. When Bessie approached her about me, she actively began to avoid me (at least as I suspected). We became aloof, as over the years I’ve practiced the art of concealing your emotions to the deepest part of your self, and she seldom appeared. I made a monumental step (for myself) of reaching out to her, with a collage of messages telling her how I liked her (which was true), how I wanted to have a relationship with her (again, true), and how I hoped that she was open to being courted. I had little to no idea how to initiate courtship, but barely two days and a Holy Week later, she replied (very discreetly) that it was not the proper time for her to be thinking about a relationship right now. She may have been flattered, but it just was not possible. This was probably coated in as soft a blow as possible, but I was still hit, and it was still painful. If I had not been used to rejections since time immemorial my life would have crumbled. As it was it just depressed me. Proto-Betty didn’t want to be Betty. At least, not as a partner. Could it be possible to be close friends? Her answer was a hesitant, almost reluctant affirmative. That answer, and her subsequent actions, indifference and aloofness definitively made it impossible to reach out to her, at least in text. One, the lack of overlapping ideas. I’ve grown accustomed to assuming the most from a girl I like, assuming that we could jive, we could be comfortable sharing ideas, that we’d be in the same wavelength (by that I mean understand each other). Based on inaccurate, partial, and offhand observation I doubt if she would understand, tolerate or even just accept my ideas, as Bessie did (just as I compared her with G in looks, now I compare her with Bessie in character). In fact, I have little to no basis for comparison, or analysis of her character. It is too heavy a risk and too large a gamble. Two, competing interests from other parties. One thing that brought me to great grief was the possibility that though she explained in the softest terms that she wasn’t ready for commitment, she readily accepted someone else. This is a large possibility of fact that aggravates the pain of rejection; you are simply unacceptable so levels of standards are different with you. In any case, the presence, or possibility of presence, of a party of interest creates a sense of obligated distance in her part. From experience, I’ve learned that partners are necessarily, rabidly, territorial with their significant others, and any form of close contact is eyed as a threat. From my experience from the side of the girl, and more recently from G’s actions, the girl is largely aloof, distant, and guarded from those with interest who are not their partner. I view with such fortune that Bessie learned to accept the closeness I have that a normal person would take with knowing discomfort. I will never be so lucky with an attached person again. Four, Veronica. I don’t know, I had to place her here somewhere. Everytime I want to be close to proto-Betty, or think about proto-Betty, I see Veronica (that’s Red Horse, although Goddess–G– will forever be in my mind) and she has this overpowering effect on me like she was an apparition from the heavens. She is that unattainable angel that I think about a lot. Five, the presence of other companions. I was very, very lucky with Bessie because she was characteristically a loner, and I wasn’t afraid that my secrets would spill out in one way or another. I wasn’t afraid that I had to share proximity with other people, and she threw ideas and things about her life freely because of the level of intimacy already present. I am coming from a vantage point of near-complete stranger. I have to contend with a dozen peers with varying closeness. I have no chance. Seventh. Age. I forgot to include this in the first publish of this post, but this cannot be ignored. I look in envy at a relationship between two peers in my place with disparate years, but it works because they are Alphas. Alphas can get away with a lot of things that us mere mortals have to be bound by. And that is the disconnect caused by a disparity in years. Alas, this is a reality I have to face. Last, level of interest. Again, I mention that I’m coming from a vantage point of complete or near-complete stranger. There is no vested interest between us. She is secure in her social world. The silence and distance we share seem a comfortable one. Why would she rattle her wellbeing with reaching out to me? This is why not once have I betrayed my intentions, or reached out, though I needed her to be, well, Betty. The prospect, then, of her assuming the role of Betty Cooper, a best friend and partner-in-crime, based on the points above, is impossible to attain. That is what saddens me the most. In the middle of a desert, she takes the form of an oasis, or at least a mirage of an oasis. And the world around me will soon crumble. Betty Cooper, the concept, the idea, the girl, is the last hope I have. I needed Betty in my life, in whatever role. In a way, I can’t help but fall in love with her, but for whatever role I need her as a part of my life. Unfortunately, I’ve already failed, and I’ll soon find myself alone in the crowd. In the midst of a collapse from all fronts, I am faced with a painful choice. Sadly, this situation will have its resolution, one way or another.